Here we are in the agricultural heartland of south Norfolk, in the rolling fields between Norwich and Thetford. 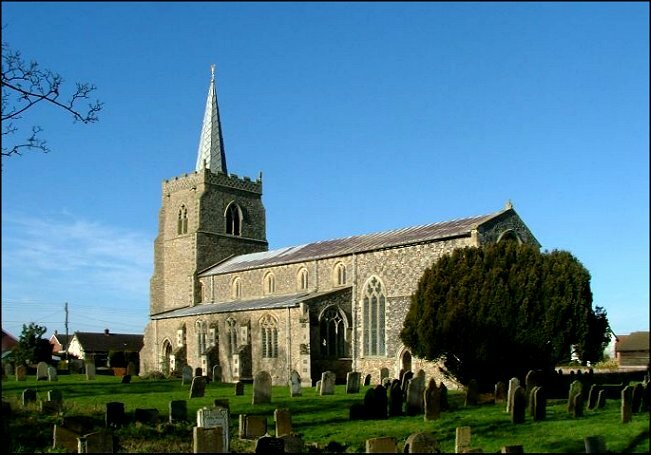 Attleborough is just a couple of miles off, but otherwise Great Ellingham is the largest village among its neighbours. 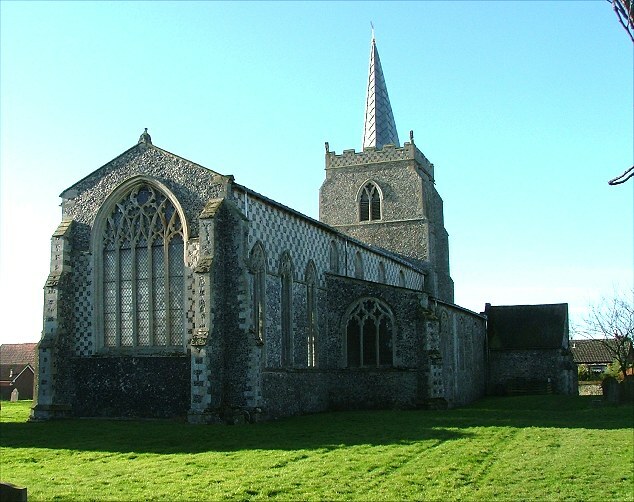 In this part of Norfolk, it's actually quite unusual to find a parish church with a village spread around it. 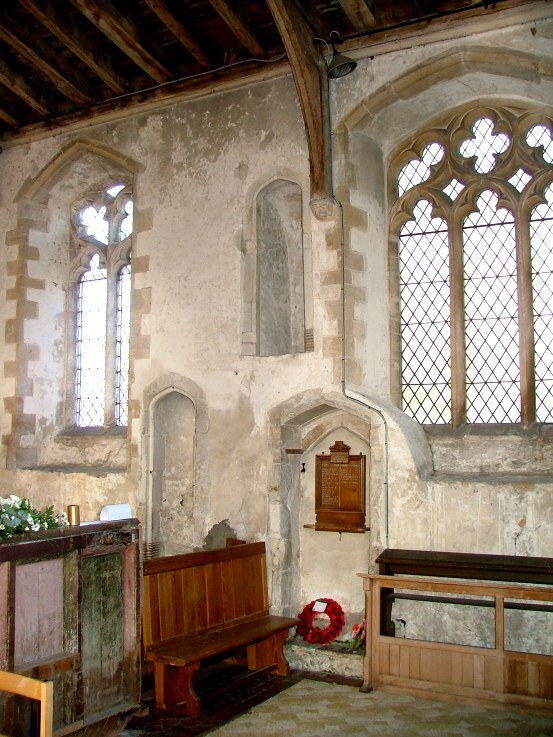 Great Ellingham is big enough to feel like a proper place, and was once a substantial parish. At the 1841 census the village had over a thousand people, and could support two pubs, two beer houses, two bakers and a butcher, as well as three blacksmiths, two wheelwrights and a shoemaker. In common with much of the rest of rural Norfolk, the population has declined since then, of course. The advent of supermarkets and the internal combustion engine has seen off all the tradesmen. But the large church still sits in its wide graveyard surrounded by attractive houses. St James is the Lord of all it surveys. 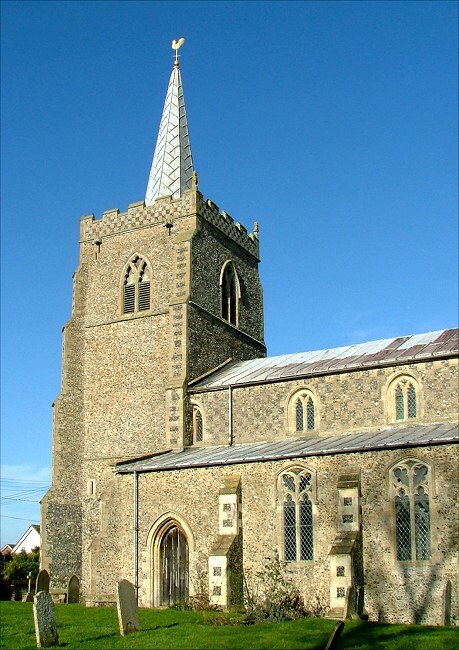 The church is typical of larger East Anglian churches in that it has a long nave and chancel, aisles and a clerestory. 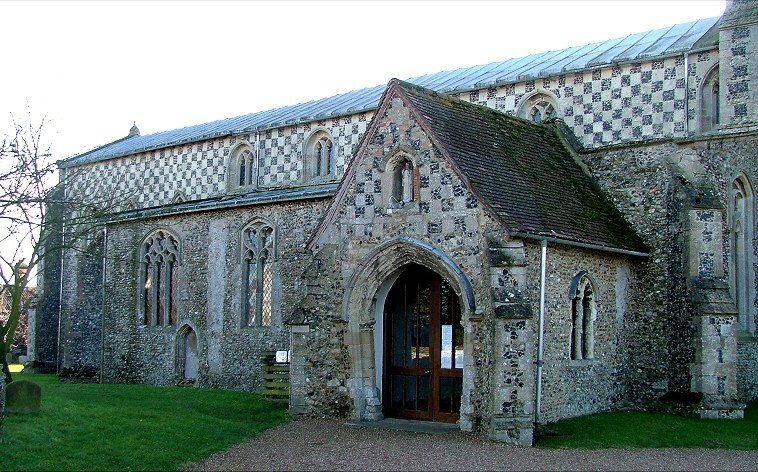 But what you see is essentially a church of the early 14th century, the Decorated period, with a spire of wood and lead; East Anglia has generally got more Perpendicular work, from a century or so later. The reason for this prominence of later architecture is that the increased prosperity of the region in the years after the Black Death, and the renewed sense of mortality that the pestilence encouraged, led to vast amounts of New Money being spent on church rebuilds. The Black Death carried off about half the population of Norfolk. But this devastation was not evenly spread; the very young and the very old bore the brunt of the disease; more people died in cities than in the countryside, and the poor suffered more than the rich. However, the rich did suffer, and the old landed estates were broken up where an owner died and no heir survived. A rising merchant class pounced on the chance to buy land, and the status that went with it. The new owners rapidly became the ruling class. But there was still the problem of death, especially when it comes like a thief in the night. The newly wealthy had to ensure that the poor of the parish would pray for their souls if they met an untimely end. A big new in-yer-face church was the best way of doing this. Perhaps the new rich themselves felt insecure. Asserting their position in stone and bricks must have helped their self-image. And there was also a need to enforce control over the imagination of the parishioners, because the naturally conservative East Anglians did not always take kindly to the parvenus of the newly moneyed, just as we did not easily warm to vulgar Thatcherism half a millennium later. But St James was not rebuilt. 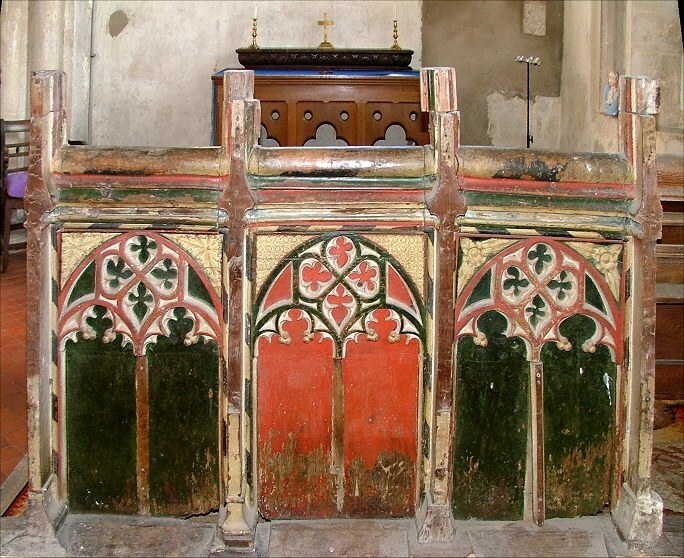 However, we should not assume that this was because the parish was unusally poor in the 15th century, or that the old order had not changed, or that there was no wealthy benefactor. It may simply be that the exterior was already so fine that all the money was spent inside on furnishings. 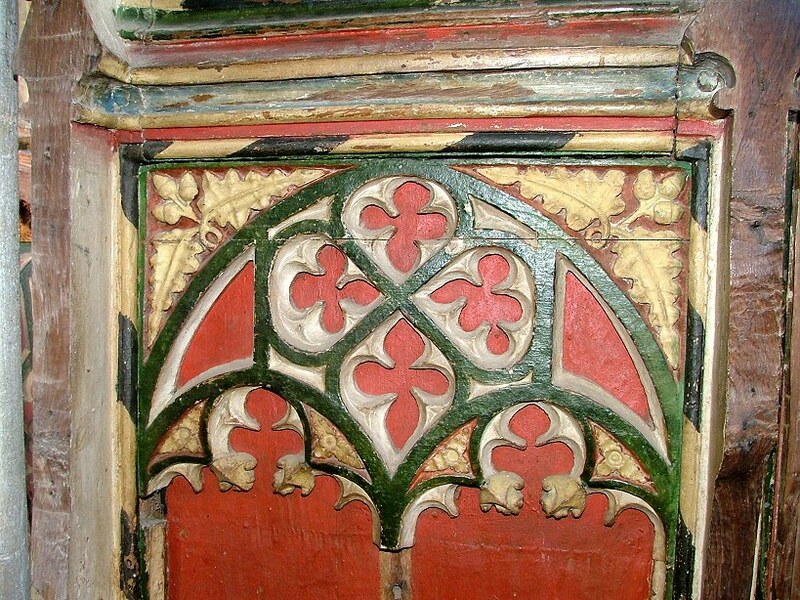 The most singular aspect of the exterior is the chequerwork. This is a decorative design whereby large square blocks of knapped flint alternate with square blocks of stone. 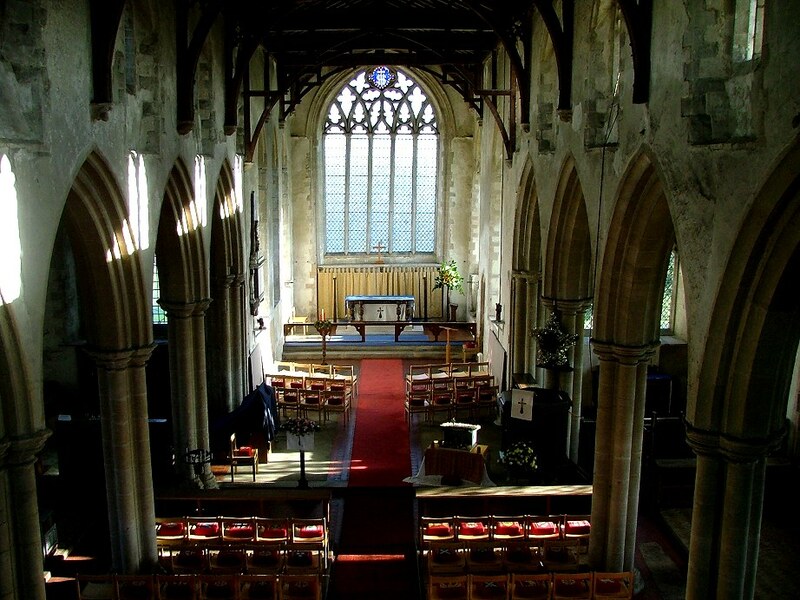 Most famously in East Anglia, it decorates the mighty church at Southwold. Here at Great Ellingham it is finer on the north side than on the south. Perhaps the best view of all is from the north-east corner of the graveyard, from where you can see both the chequerwork and the glorious east window with its flowing tracery. Seeing such a grand exterior, you may fear an overwhelming Victorianisation of the interior. 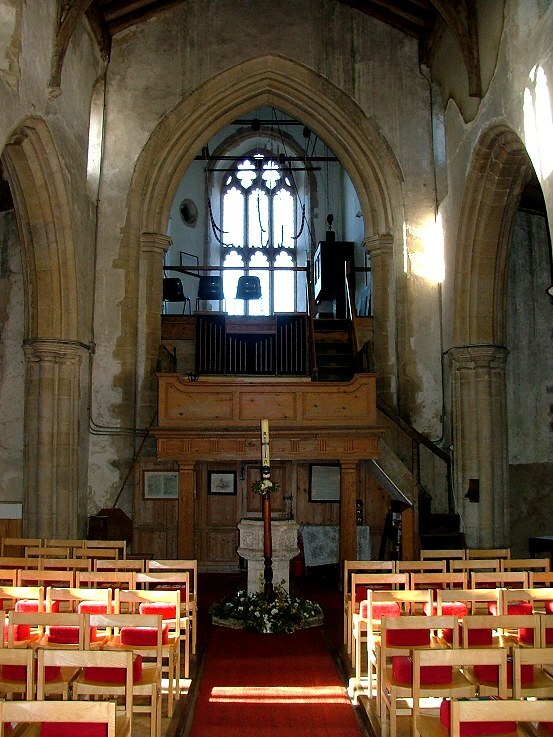 Bigger churches tended to be in poor condition by the 19th century after long years of neglect, and the Victorians could often not resist imposing a grand, urban, anonymous interior on these large country churches, quite out of keeping with the character and history of the building. A good, or perhaps that should be bad, example of that kind of thing around here is a few miles off at Hingham. However, do not fear. St James has the great benefit of an interior which is at once wholly rustic and grand, a difficult combination that always takes the breath away when it works. It does here. 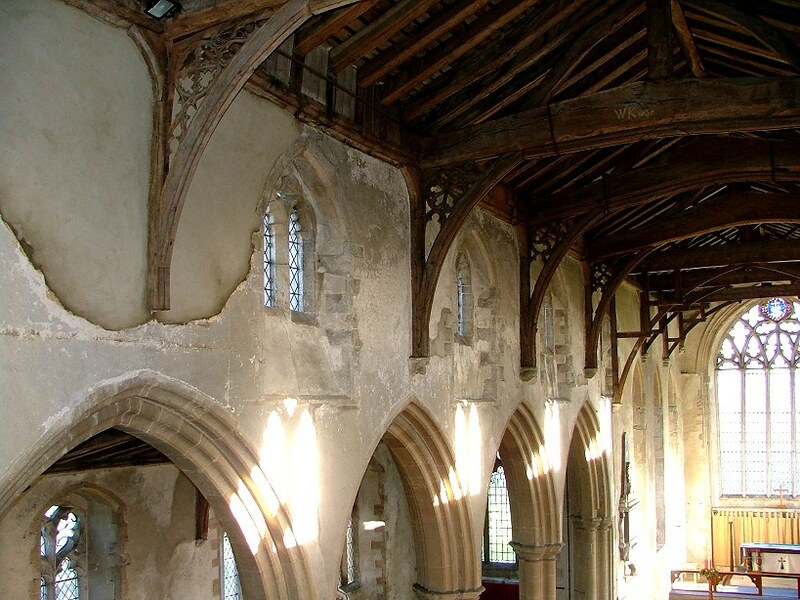 The tall, unbroken nave and chancel are bright and open beneath rank upon rank of ancient beams. 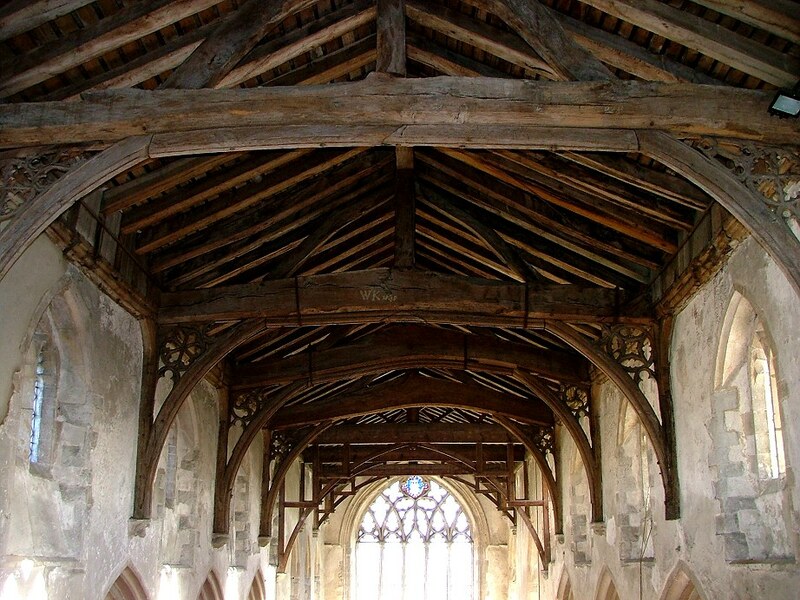 A 15th century arch-braced roof crowns the nave, and there is one of the late 18th century in the chancel, which looks as if it has been hewn out of rough timber. 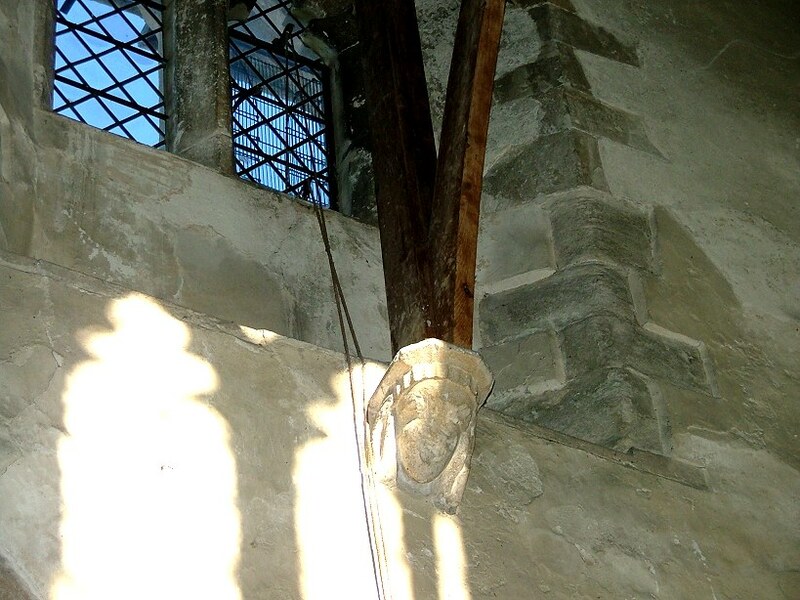 Best of all, you can climb to the ringers gallery beneath the tower to see it all at close quarters, and to gaze eastwards through a forest of beams. 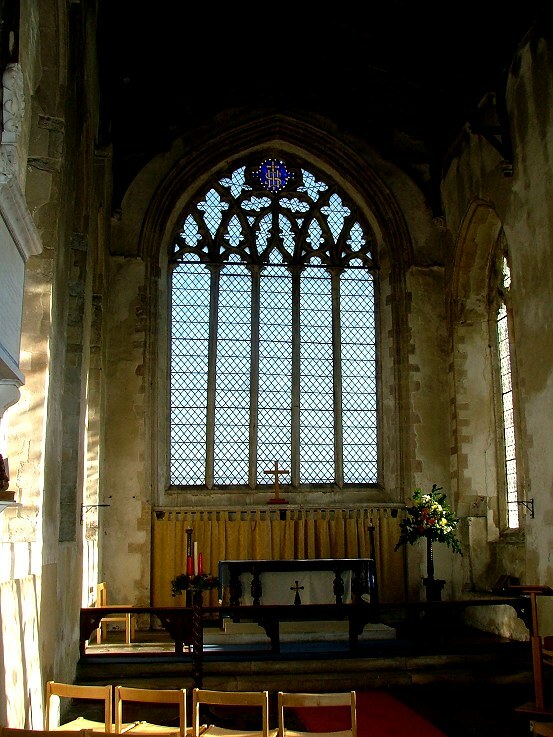 The great east window carries the eye onwards, and fills the building with light. 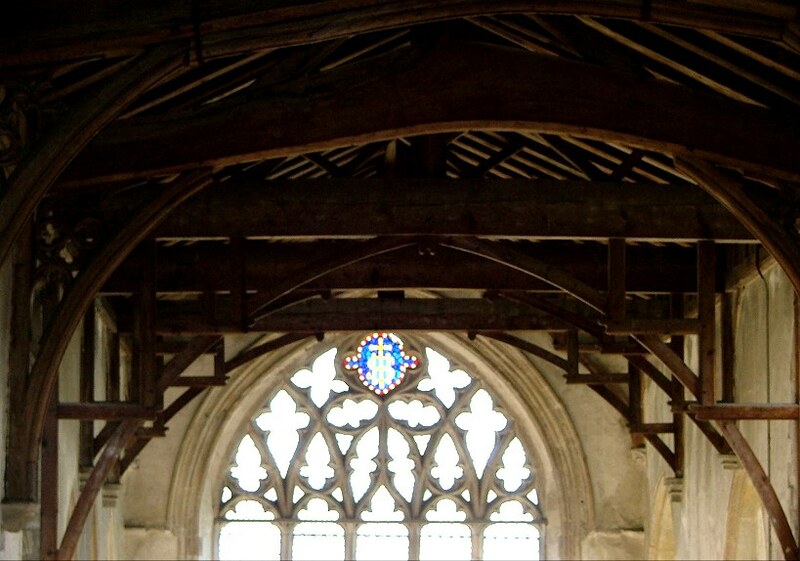 Cautley didn't think much of the chancel roof, but it has great character, particularly the way that the carpenter supported it by carrying the uprights over the clerestory windows. Judging by the position of the corbels, this must always have been the case. Back on the ground, modern chairs and simple furnishings create a welcoming feeling; despite the mystical architecture, this is a friendly place. 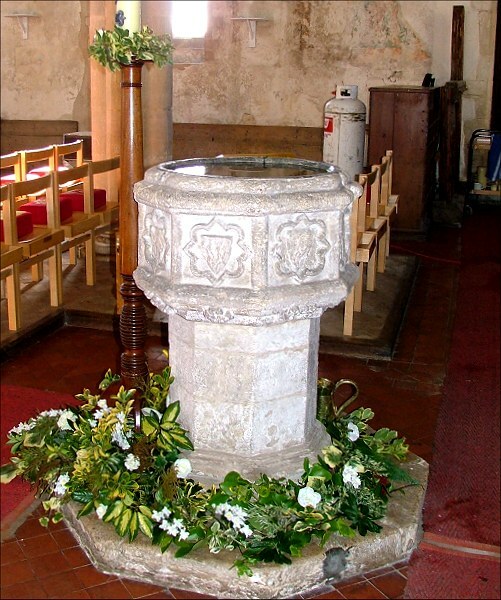 The font, with shields in lozenges, is 14th century and must be contemporary with the grand rebuilding of the time. It is kept full of holy water to act as a stoup, and this combined with the smell of incense might give you a sense of the character of the worship here. The wide aisles are a pleasant place to wander, not least because they are home to a variety of medieval survivals and some fine 20th century work, a happy combination. The lack of 19th century glass means that they are filled with light. Indeed, you would be hard pressed to find anything of the 19th century at all here, which shows considerable skill and sleight of hand on the part of the Victorians, since the layout of the interior here is certainly a 19th century reinvention of its medieval past. During the 17th and 18th centuries, St James was more of a preaching house than a sacramental space. Perhaps the most interesting survivals are the wall paintings. 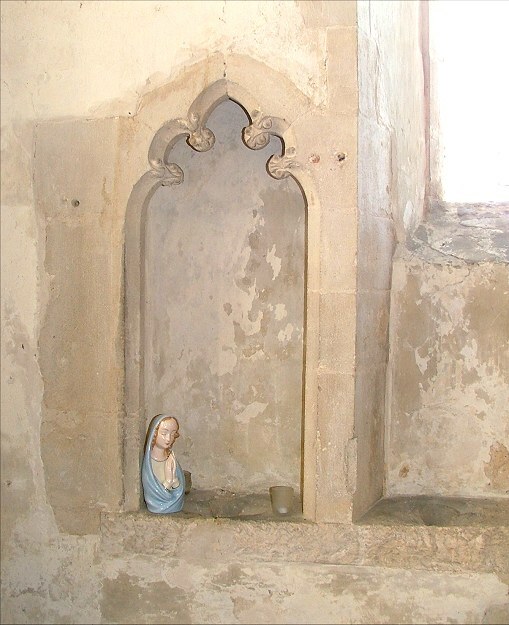 There is a large image niche near to the east end of the south aisle that was once part of the shrine to Our Lady of Ellingham. 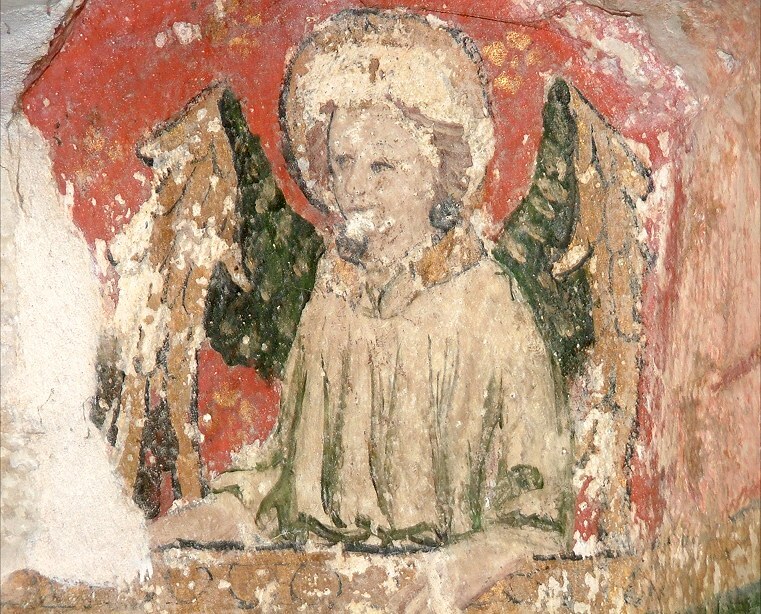 It is painted in rich greens and reads, and includes angels in exquisite detail at the top. A piscina on the far side of the window embrasure is contemporary with it. A more interesting painting is at the west end of the aisle. 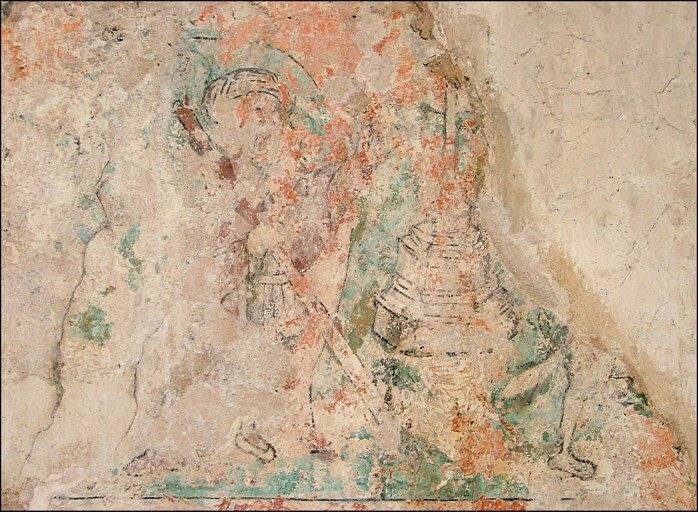 It shows, or appears to show, a traveller with a pilgrim staff approaching a preaching cross, while on the far side a creature with a tail walks away. The pilgrim figure has been variously interpreted as St James or St Christopher, neither of which is wholly satisfactory. 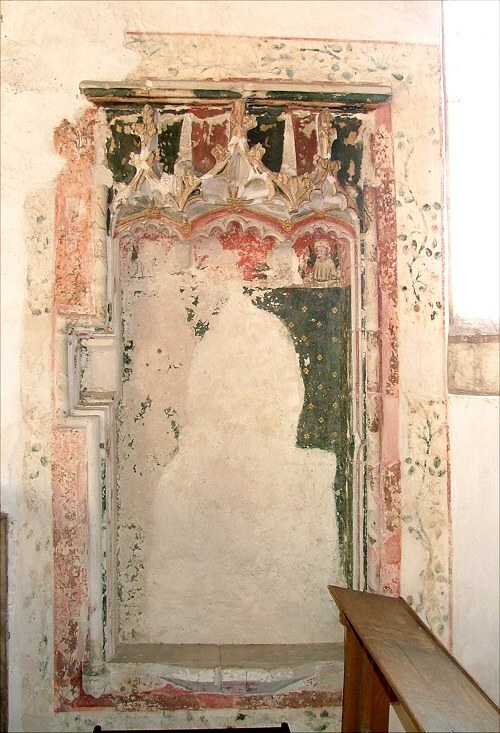 This painting reminds me of the boss in the porch at Norwich St Stephen which depicts a cloaked figure, and a preaching cross, and what may be a devil. The boss has also never been satisfactorily explained. In the north aisle, the entrance to the rood loft stairs shows that the screen stretched right the way across the church, and must have been very impressive indeed, especially in such a high space. Very little of it survives. A few bays of the dado cordon off the chapel of Our Lady in the south aisle, and there are some more panels at the west end of that aisle near to the south door. As I said, there is very little coloured glass here, but what there is is fine. St James in the south aisle dates from the 1920s (he looks more recent) and this window depicts the legend of Santiago de Compostella, St James of the Field of Stars. As Mortlock points out, the artist didn't realise that in the Legend of St James the boat traditionally arrives without sails, but never mind. I said that this church is both rustic and grand, but it is not a grandness which depends on the patronage of a landed family. There are very few memorials, and these are mostly understated. 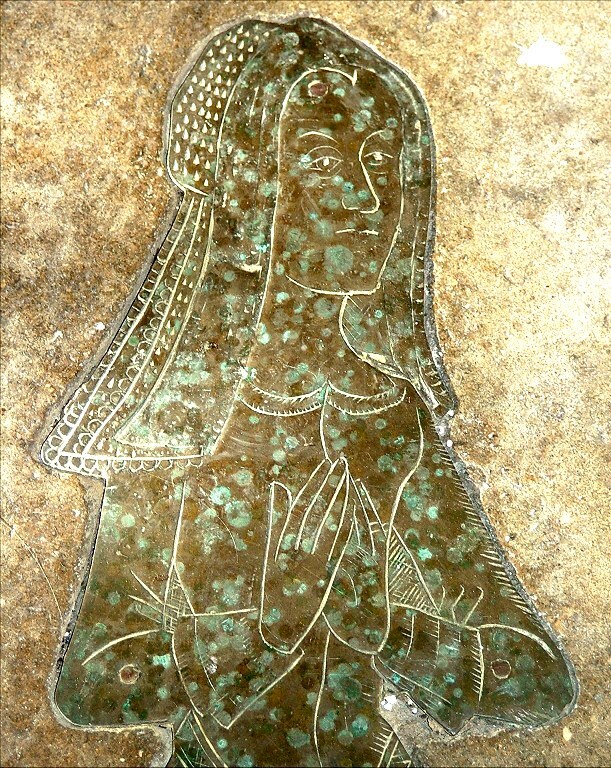 Even the church's only brass, up in the chancel, is a simple yet lovely lady wearing a rather ordinary head dress and gown. 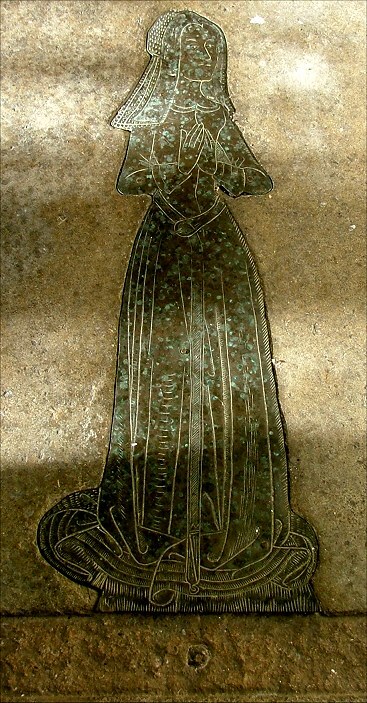 She is believed to be Anne Conners, and to date from about 1500. The church of St James is a good example of the way that centuries of both care and neglect can conspire to produce something organically beautiful, a building that feels loved and used, abounding in character all of its own. I liked it a lot, and will certainly come back.